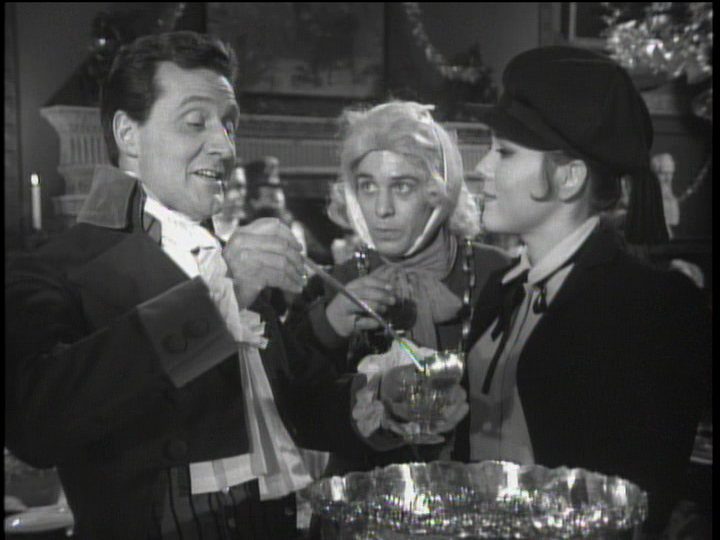 All of this is set at an English mansion where Peel was invited for a Christmas party. She invites John after the idea to bring him just pops into her head. He's already been having nightmares which are proving eerily prophetic. He dreams of a friend the night he dies, and he seems to know the way to the mansion after seeing it in one of his nightmares. I'm fairly certain some of this is an homage to the classic horror anthology, Dead of Night, which actually includes a segment set during the holidays (though it's neither the most interesting segment nor long enough to justify calling a Christmas movie). That movie also opens with a character reliving a similar drive to a secluded countryside location they've seen in a dream. 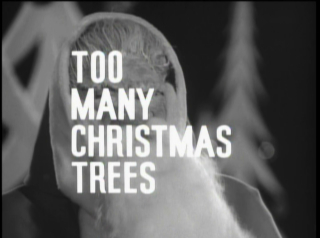 Getting back to Too Many Christmas Trees, Steed arrives feeling exhausted, which only gets worse every time he falls asleep and is confronted with another nightmare. His dreams are filled with warped Christmas imagery and a sadistic, malformed Father Christmas. More and more of his visions are mirrored by what he sees at the party: gifts and guests appear in both. Even without all this, the party would be plenty creepy on its own. The host is obsessed with Charles Dickens and has decked out each room to thematically connect to a different work or scene. There's a plenty of Christmas Carol, naturally, but there are also allusions to Great Expectations, A Tale of Two Cities, and more. Even as John seems as though he's losing his mind, Emma retains her sense of humor and her cool. She pieces together what's happening, but is captured at gunpoint before she can act. Not that she's delayed long - the psychics may succeed in maintaining a creepy appearance, but she tears through them one-by-one easily enough. As for John, he was exaggerating the success of their attacks in order to lure them into the open. Turns out he was trained for this sort of thing. While the action and some of the sets betray the limitations on budget and the era this was made, the episode is still a lot of fun. The imagery in the dream sequences is legitimately disturbing, particularly the grotesque Father Christmas. And of course, the banter between Steed and Peel is fantastic. All in all, this is a wonderful spy-fi artifact from the 60s elevated by great performances and a gleefully bonkers premise - it's definitely highly recommended for fans of the era or genre in general. That does make it even more unfortunate this is hard to track down. It doesn't seem to be streaming anywhere, free or paid, so your best bet is tracking down one of the collections it appears on.